I recently purchased and read DeClutter Fast by Mimi Tanner. I’m always looking for new angles on how to get organized as quick and painlessly as possible! I consider myself an organized person, but some areas of my home take a lot more effort. This ebook will appeal to anyone who has tried to organize using the four tub method (keep, toss, donate, sell) and was frustrated by the pressure to toss, donate and sell items they’re still very attached to. Mimi’s method of removing clutter allows people to keep their stuff until they’re ready to let go of it. I know, it sounds counterproductive to some of us to keep our clutter, but really, using this method removes the clutter from under your nose so you can focus on moving ahead and living life and then return to those items when you’re ready. And guess what, once things have been unseen and unused for some time, you’re more easily able to let them go! I know this from personal experience. When I moved across country I left a bunch of belongings in my parent’s shed. Years later they dumped it all. The only thing I really remember amongst that stuff was a pair of shoes that I could really be fine without. Who knew! They could have used all that space for their own belongings if I had just gotten rid of it when I moved away! Sorry Mom & Dad! I’m the type who likes to browse through books at the bookstore before making a choice. I’m sure you’re curious exactly what’s in this book. DeClutter Fast is a quick 71 page read and gets right to the point, allowing you to get started decluttering the same day you read it. It will not take you several days to read and schedule and plan to get your organizing goals under way. Chapter 1 talks about clutter and how it impacts our lives. Chapter 2 talks about various methods for decluttering and how everyone has different ways of dealing with things when it comes to getting organized. This is the real heart of the book, the actual instructions broken down in detail on how to deal with various clutter in your home and exactly how to get it out! And yes, she talks about how to handle items that you’re just not ready to let go of yet. Chapter 3 focuses on filing and organizing our paper clutter and how to manage clothing. She also gives tips on how to break procrastination and advice about how to live your whole life in an organized way, not just how to have your rooms clear of clutter. Chapter 4 is about staying clutter free. Here, she gives advice regarding how to maintain what you’ve accomplished. Chapter 5 gives you a method for removing clutter in an emergency. Woops, company is coming? Give this method a try. Start removing the clutter from your home now! How to remove clutter from your entire home within two days, maximum. How to keep all the things you want and still be clutter free. Why the traditional “four-box method” of removing clutter doesn’t work for many people. How to tackle all of your paperwork. How to organize your clothing. The 17 Essentials that you need to find a place for in your home. How to organize the rest of your life. Even I learned some new techniques and had my eyes opened to new ways of approaching the goal of living organized. There are a lot of great ideas to work with in this short book. Sometimes making those tough decision about keeping or getting rid of things can be emotionally exhausting, leading us to toss our organizing plan aside before we finish If you’ve tried to organize using the four-box method only to find a larger mess and more stress, then this book is definitely something you should check out. 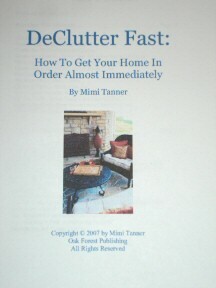 Go ahead and take a peek at Mimi Tanner’s Declutter Fast ebook. There’s no risk because she offers an unconditional money back guarantee if you’re not pleased with it. Simply send her an email. If you decide to purchase the ebook, you’ll also receive a bonus book. If nothing else, you should at least sign up for her decluttering tips to be sent to your inbox. It’s time to get the clutter out of your home and get rid of the stress of all that “stuff” staring you down daily, zapping you of your energy, your space, and the comfortable home you dream about.